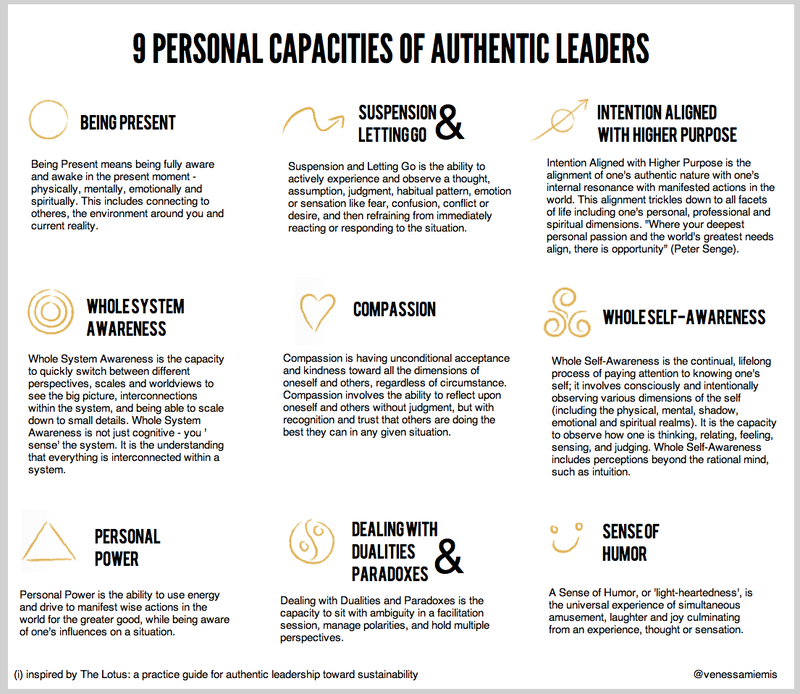 I came across the book The Lotus: a practice guide for authentic leadership toward sustainability on blurb.com yesterday. Being Present means being fully aware and awake in the present moment – physically, mentally, emotionally and spiritually. This includes connecting to otheres, the environment around you and current reality. Suspension and Letting Go is the ability to actively experience and observe a thought, assumption, judgment, habitual pattern, emotion or sensation like fear, confusion, conflict or desire, and then refraining from immediately reacting or responding to the situation. Intention Aligned with Higher Purpose is the alignment of one’s authentic nature with one’s internal resonance with manifested actions in the world. This alignment trickles down to all facets of life including one’s personal, professional and spiritual dimensions. “Where your deepest personal passion and the world’s greatest needs align, there is opportunity” (Peter Senge). Whole System Awareness is the capacity to quickly switch between different perspectives, scales and worldviews to see the big picture, interconnections within the system, and being able to scale down to small details. Whole System Awareness is not just cognitive – you ‘sense’ the system. It is the understanding that everything is interconnected within a system. Compassion is having unconditional acceptance and kindness toward all the dimensions of oneself and others, regardless of circumstance. Compassion involves the ability to reflect upon oneself and others without judgment, but with recognition and trust that others are doing the best they can in any given situation. Whole Self-Awareness is the continual, lifelong process of paying attention to knowing one’s self; it involves consciously and intentionally observing various dimensions of the self (including the physical, mental, shadow, emotional and spiritual realms). It is the capacity to observe how one is thinking, relating, feeling, sensing, and judging. Whole Self-Awareness includes perceptions beyond the rational mind, such as intuition. Personal Power is the ability to use energy and drive to manifest wise actions in the world for the greater good, while being aware of one’s influences on a situation. Dealing with Dualities and Paradoxes is the capacity to sit with ambiguity in a facilitation session, manage polarities, and hold multiple perspectives. A Sense of Humor, or ‘light-heartedness’, is the universal experience of simultaneous amusement, laughter and joy culminating from an experience, thought or sensation. A useful set. Are they categories (boxes) or themes (threads)? How do they interact? How are they acquired? What are measures for these traits in distribution among persons in different cultures and environments? Given your interests/skills in leadership, community action, self-awareness and yoga I wondered if you might also be interested in this: http://offthematintotheworld.org – as it brings all these threads together. I really like this! Thank you for posting. Venessa: This is a very fine depiction of the qualities that enable clear communication and supportive interaction within a team. Even ‘whole self-awareness,’ which would appear to operate primarily in one’s internal life, is essential if a person is to maintain balance, objectivity, and empathy in dealing with others. And although TGI’s ‘technology of teaming’ does not specifically pinpoint these qualities, they are all to be found in people who exhibit the teaming metric of Coherence. I like very much that compassion is in the center; good design starts there. I’m taking some pointers from this site for my personal blog. May I have the permission to use that infographic? Thanks! @PRC Board Exam and others, who would like to repost it on their site: please refer to the original research that’s behind this (www.thelotus.info).